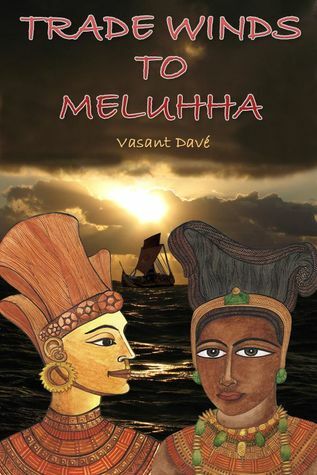 The period of the novel Trade Winds of Meluha by Vasant Davé is 2138 BC and set in the Bronze Ages of Mesopotamia and Indus Valley Civilization. The novelist puts on array a total of fourteen characters, ranging from single women, to seven and nine year old boys, to villains with marks across their cheeks. There is a hero who is a Mesopotamian stable boy and the story kicks off with a murder which precipitates the boy’s journey from Mesopotamia, which is obviously today’s Iraq to Meluha, an imaginary land, and the novel is all about what happens there and to him. The story spreads across 45 chapters, that may sound scary, but it’s just 3-4 pages per chapter, and this is an e-book after all. It’s perhaps difficult for a layman reader to imagine so far back a sequence, and keep in mind so many characters and places with unfamiliar names, so the author stands by with ready reckoners to assist the reader. The following are the reading aids offered by the author. A character list that appears at the beginning of the novel, which has a prompt which goes to the page where the character first appears; a map of his voyage where he travels from Mesopotamia to Meluha, as also a list of the place names in the narrative; and a glossary of Sumerian and Tamil words. Davé has obviously done extensive research for this project; it’s not a sketchy and unbelievable ambience that he has created in the novel, but a conscious and determined effort which borders on the didactic, in his endeavour to lay out the right flavor to the reader. The story flows well, and the reader is amused enough to read on to the next page to know what’s happening to the hero. The hero faces plenty of difficulties, but he is equipped to help himself in physique and brains. The contemporary life depicted in two different civilizations is interestingly believable, especially with incidents of voyeurism and the way young girls deal with them. The ‘age-old wisdom’ of how older men and good for young girls are a reflection on perhaps how the author perceives the current world, as that which has achieved no step forward. Yes, there are women protagonists as developed enough to send the story on nice spins, the reader does not miss the feminine flavours in the story just because it’s a historical fiction narrative. Davé brings in elements of nature to aid his pace and build of the story, we see a total solar eclipse, a total lunar eclipse, both of which happen in quick succession in real time Babylon; and several sandstorms which edge the storyline on in directions where more stories lie in wait of the reader. It’s a story that’s certainly ‘told’, and never ‘shown’ on the pages of the book, the back stories of the lives and incidents of the hero and villain are narrated to us in the thoughts of protagonists. The story is certainly long-winded, but the wait till the last page is worth it, the author brings us to a satisfactory conclusion and the reader does feel the intellectual challenge offered. I wish this manuscript had passed the blue pencil of a vigilant editor; it would have tightened the script to make the story rid itself of a tense issue here and there (like the last line on page 16 where Sam says to Ella, ‘I don’t care about others but I don’t wish that you too ‘misunderstood’ me’. On page 17, Ella says about the necklace, ‘It seems to be one of the three my father ordered to a merchant in Meluhha.’ There are some typos too. However this is certainly one of the credible stories in the market bridging two ancient civilizations rather convincingly. Posted in Authors, Book, Reviews and tagged Trade Winds of Meluha, Vasant Davé. Bookmark the permalink.